If you have an existing customer base to market to, there is a very simple way to grow your business other than chasing new leads, and that is customer retention. Of course you need new, fresh, ideal leads being generated on a regular basis going forward. But it shouldn’t be your only focus. 60 to 80% of your energy and systems should be directed towards retaining customers that you already have. Increasing customer loyalty and understanding how to deliver even more added value to your customer base is of critical importance, in growing a business. Now more than ever customers have a very high expectation of businesses they deal with, especially high ticket businesses.As the old saying goes “people don’t care how much you know, until they know how much you care”. Your customers will quickly pick up on any false promises, shoddy treatment and inferior service or products. Your commitment to building a strong and lasting relationship with each and every customer must be genuine. If it is not, you will not be able to maintain the stamina needed to drive your business forward. The investment you make in your customer loyalty programs and retention strategies will pay you back many fold. You’ve already expended a lot of time and money winning your existing customer database. It makes sense financially, as well as efficiency wise, to maximise that investment. As you are aware, the cost of acquiring a new customer is quite high, as opposed to the cost of marketing to an existing customer. The conversion rate of sales messages to existing customers is also higher. This means, of course, that your marketing costs are lower. Authorities on this subject, such as John L. Daly author of Pricing for Profitability, estimate the cost of acquiring a new customer, as opposed to retaining and marketing to existing customer, is four to ten times more expensive! Companies, such as Bain and Co., believe that a 5% increase in customer retention can increase profitability by 75%. The greater the percentage of your customer base you retain over the years the more impact it has on your profitability – in a good way. To get that 75% increase via winning new customers is a lot harder. By keeping your loyal customers you could see up to 80% of your future sales emanating from a small core of them. These dedicated customers don’t just buy gain and again from you. They refer friends and family to your business. Short term thinking and a total focus on new customer acquisition will see many businesses suffering from customers defecting to competing businesses who know how to keep them. 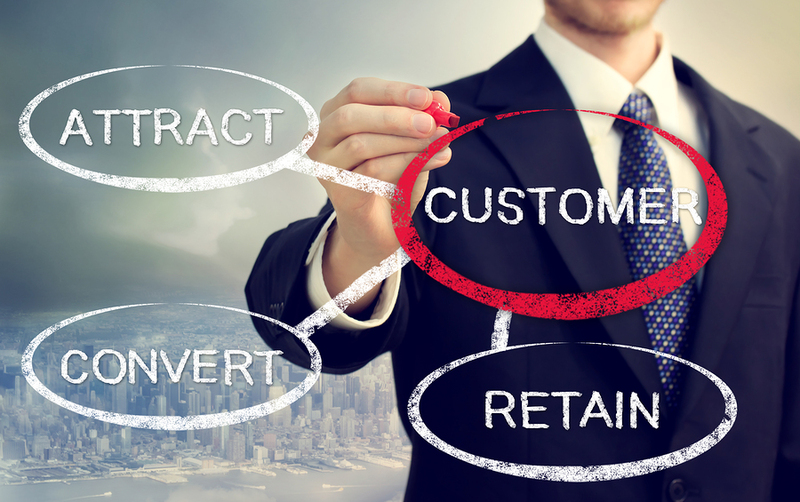 With this focus on new customers your marketing costs will be high and your retention rates low. One knock on effect will be to the perceived value of your business. One of the biggest assets any company has is its customer base. Yes, building relationships with your customers takes time and patience, just like when you build personal friendships. But the rewards are worth it. When times get tough, as they do from time to time, how is your business positioned? Is it strong and stable with loyal customers that will stay with you, or will they seek the attentions of your competitors? Measure your customer retention rate as a key metric in your business and always look to improving it.